People are thought to have the task to form a middle and a connection between heaven and earth. 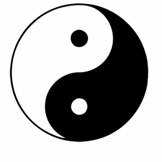 Tai Ji is the great unity, in which the polarities of Yin and Yang are contained. Practising Tai Ji is a way of moving and strengthening the internal energy Qi, which corresponds to Ki in Japanese (as in Aikido) and Prana in Indian Yoga. Unlike the external martial arts which rely on muscle strength, such as boxing, karate, judo etc., Tai Ji uses the mind to move the Qi, and the movements are completed without any muscle tension, with a relaxed body and a concentrated mind. If the movements are done correctly, the Qi flows along its meridians throughout the body. This energy flow can be felt as a stream of prickly warmth. In this six day course the long Tai Ji form of the Yang family will be taught. The Original Yang form consists of a series of movements which involves about 140 positions with plenty of repetitions, performed in a slow, flowing way, and taking about 15 minutes. You will learn approximately the first half of the form, with three to four hours of tuition each day plus practice. The rate of progress depends on the participants. The aim is to provide you with enough Tai Ji to practise alone at home. You will also learn a number of Qi Gong exercises which we use as warm ups and which on their own form a satisfying practice. 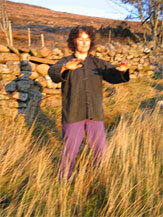 Kathrin has been practising Tai Ji and Qi Gong since 1984. She started her practice with Master Chu (London) and his master disciple Frieder Anders (Frankfurt) and she has also studied with a number of other teachers, including Aloka (Zurich) and Chungliang Al Huang. She practises and teaches Master Chu's long Yang form above all else.